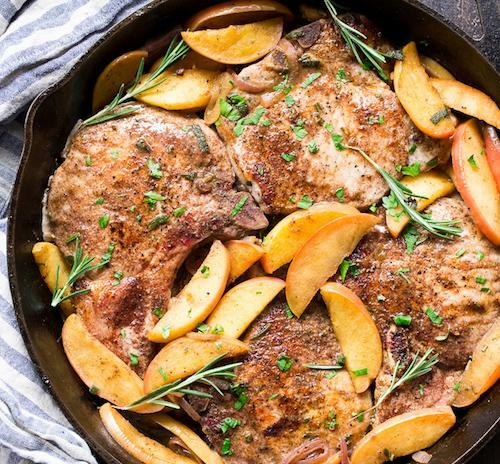 Sure to be a fall favorite, these super easy pork chops and apples pair well with any salad or side dish! Preheat oven to 400°F. Season pork chops on both sides with salt and pepper. Heat oil in a large skillet over medium-high. Sear pork chops, turning occasionally (including outside edge of fat cap), until browned all over, 8–10 minutes. Transfer chops to a roasting pan. Cook apples, sage, and 1/2 tsp. salt in same skillet over medium heat, turning apples, until browned on all sides, about 3 minutes. Transfer apples and sage to roasting pan, nestling around chops. Transfer roasting pan to oven and roast until chops are cooked through and an instant-read thermometer inserted into center of chops registers 160°F, 8–10 minutes. Divide chops among plates and serve with apples and sage alongside. Choose your favorite fall vegetables to roast as a side dish!